This document is from the http://www.railarchive.org.uk" >www.railarchive.org.uk private collection housed at the Bodleian Library Oxford in the John Johnson collection. Bishop Auckland gained its first rail link in 1842, when the Stockton and Darlington Railway (S&DR) backed Bishop Auckland and Weardale Railway (BA&WR) gained the powers via an Act of Parliament to build a railway line from the S&DR's station at Shildon via Bishop Auckland and Witton-le-Wear into Crook, County Durham. The company initially built a temporary terminus at South Church, which opened on 19 April 1842. A road coach service then extended the service into Bishop Auckland, and a secondary road coach service also ran to Rainton Meadows. After completion of the Shildon tunnel, the BA&WR erected a permanent station on the current site, which opened to freight on 8 November 1843, and passengers on 30 January 1843. All operations were sub-leased as agreed to the S&DR. 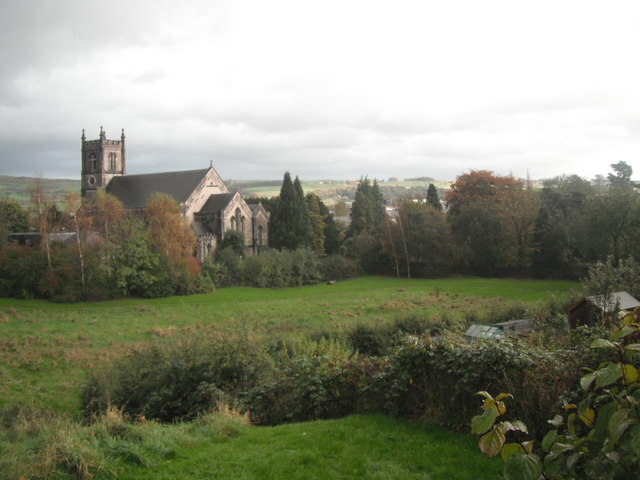 In 1844, after the West Durham Railway extended from a junction with the Clarence Railway at Byers Green to Crook, the S&DR extended the BA&WR from Bishop Auckland along the river valley to Witton-le-Wear, and then into Crook. 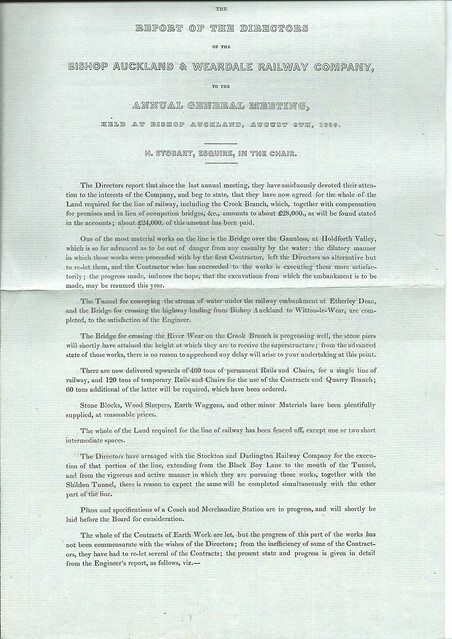 In 1845, the S&DR came to an agreement with the Derwent Iron Company to sub-lease the southern section of the former Stanhope and Tyne Railway. It extended the line from Crook to Waskerley and then to Blackhill, and it was opened as the Weardale Extension Railway (WXR). In July 1845 Parliament passed the Wear Valley Act, which allowed the extension of the BA&WR from a junction at Witton-le-Wear to Frosterley, and a small branch line across the river to Bishopley. With all works again undertaken by the S&DR, this line opened on 3 August 1847. After these works had been completed, the BA&WR amalgamated with the WXR. All service were operated by the S&DR, which officially took over the new company in January 1857. On 1 April 1857, the North Eastern Railway (NER) started a service from Durham to Bishop Auckland at a new terminus in Tenter Street. However, the S&DR and NER quickly came to the agreement of development of a joint station in the town, and so rebuilt the existing former BA&WR station, with NER trains using it from December 1857. In 1862, an Act of Parliament was passed allowing the S&DR backed Frosterley & Stanhope Railway to extend the line to Stanhope, thus allowing trains to transport limestone from the Newlandside Estate on the south side of the town. This brought about the extension of the South Durham and Lancashire Union Railway from Barnard Castle into Bishop Auckland in 1862, and with the final addition of traffic from an extension of the Clarence Railway at Byers Green, eventually resulted in the NER rebuilding the station again in December 1867. The final extension of the Weardale Railway to Wearhead opened on 21 October 1895, with the NER having re-sited the station at Stanhope to provide a more suitable gradient for the heavy limestone trains. Between Eastgate and Westgate at Cambo Keels, sidings were established to serve the Weardale Iron Company's Heights limestone quarry, which is still in operation today. This final extension of the Weardale Railway bought about the final and largest layout of Bishop Auckland railway station, which was now rebuilt in triangular form with four platforms in 1905. Only three of these were normally used for passenger trains, with platform 1 handing trains towards Crook & Wearhead and platforms 2 & 3 dealing with services on the Barnard Castle, Ferryhill & Durham lines. Platform 4 (on the chord linking the Durham & Crook lines) was mostly used for parcels & newspaper traffic and for racing pigeon specials. As elsewhere the UK, rail traffic in the area declined after World War II, with the Wearhead branch the first to lose its passenger trains in 1953. The principal closures came in the 1960s mainly as a result of the Beeching Axe, with services to: Barnard Castle via West Auckland ending in June 1962; Durham in May 1964; and Crook in March 1965. 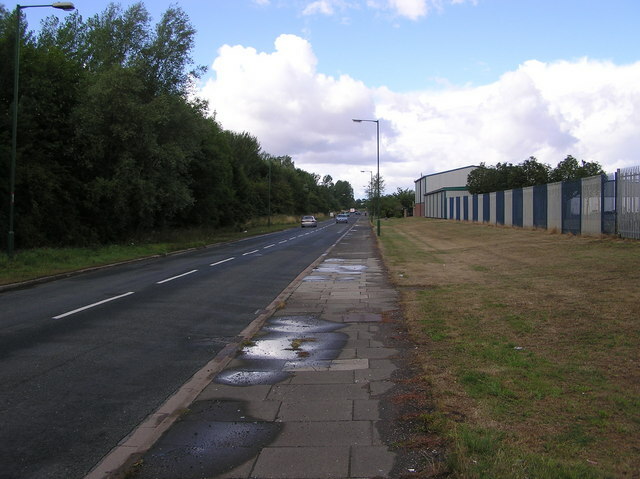 This left only the former original S&DR line to Darlington line in operation, along with the freight-only branch traffic to Eastgate. The station remained more or less intact (although increasingly forlorn and run-down) for more than 20 years thereafter, though by the early 1980s only the former platform 3 was in use (along with the former Bishop Auckland East signal box). It was eventually replaced by the current structure on 6 June 1986. This stands on the site of the former Crook branch platform, on a siding off the now single 'main' line which continues on towards Stanhope & Eastgate. The signal box was abolished at the same time, with neighbouring Shildon box assuming control of the much-simplified layout. 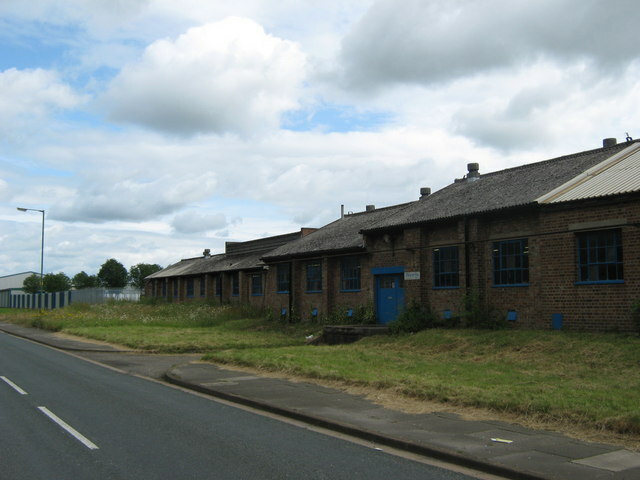 The remaining station buildings were then demolished and the site sold off for retail redevelopment. The former goods yard is now a supermarket with car park, and the Durham platform is now the site of a cycling and motoring store and a bank.